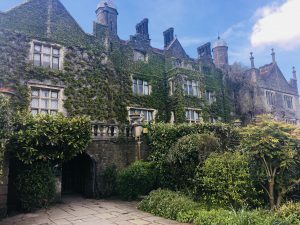 This is my post on Eastwell Manor – for those of you interested in a spa break in Kent. If you can’t view the video, please click here. 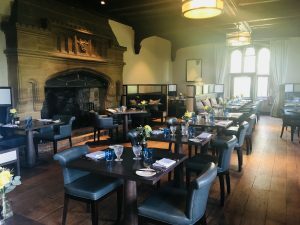 I must point out that I filmed the footage for this video back in May when I took my mum to Champneys Eastwell Manor Spa Hotel for afternoon tea. I thought I might take some photos for social media posts, but I was so blown away by the place I ended up wanting to do a video – and left mum drinking champagne with some new friends she’d made! I’ve been so busy with various projects, mainly finishing my book, that the video has been put to one side. Having just booked a stay there in September though, I was inspired to go and edit it. My, I’d forgotten just how beautiful and special a place it is. This Champneys spa hotel is deep in the countryside near Ashford in Kent. The backdrop of greenery surrounding it is a rare treat to start with. 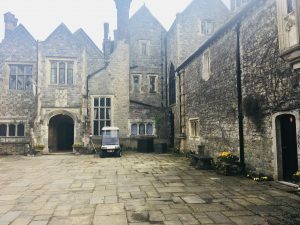 Although the manor dates back to the mid 1500s, the current building was built in neo-Elizabethan style in the late 18th century. You enter the impressive reception via a courtyard. I can imagine a welcoming, roaring fire being the centre of attention here in the middle of winter. With sweeping staircases, intricate wood panelling and leaded windows, if you love a period property it’s a real feast. Although I didn’t stay the night, I did get a peak at some of the rooms. 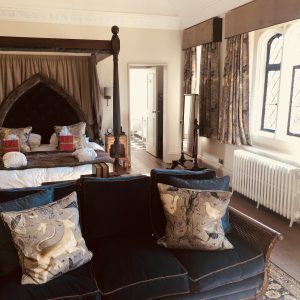 Recently refurbished they have all the charming appeal you would expect of a country manor hotel, but refreshed sympathetically. The grounds are amazing! I mean A-M-A-Z-I-N-G!!! 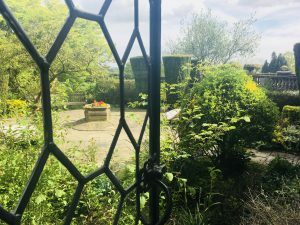 You have quirky stone walls, and what feel like secret passages leading to a falconry area – I really wasn’t expecting that! There’s a par 32 USPGA standard 9 hole goal course, tennis courts, loads of other games and an outdoor heated swimming pool. But just the sheer space in front of you as you sip a cocktail on the veranda just makes it feel phenomenally special. Champneys spa break in Kent anyone? I haven’t even got to the spa bit yet! So there is a Champneys Spa, with just about every treatment you can think of and beautiful facilities. I have spent a day there writing my book, and it has a very relaxed and healthy vibe. So obviously I’m impressed (not sure how obvious that was! ), and would hands down recommend this to anyone after a spa break in Kent. I’ll also add what I find when I actually stay there and eat in the restaurant in September. Oh my goodness, it didn’t disappoint – quite the opposite in fact! We had the most divine room in the manor. I actually just wanted to sit in there all afternoon and soak it in! 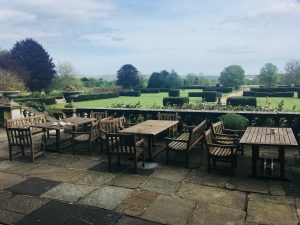 I was dragged out by hubby though to play petanque and badminton – so much fun, and just amazing to have so much there in the grounds. Dinner was delicious. I went for the Cote de boeuf, which was cooked to perfection, but the service was also second to none. Next time I go I’m definitely going to try out some of the classes. This time around I was feeling lazy and as I was treated to a champagne breakfast I wasn’t feeling quite in the mood for yoga! The spa day was truly relaxing. I love the day beds they have there, which meant hubby and I could have a really romantic spa day. We both had treatments, I had a really thorough deep tissue massage, which was just what I needed. I actually couldn’t believe the strength of this tiny masseuse!!! 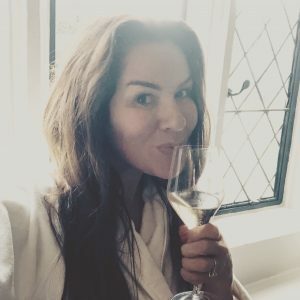 The only thing I would say is that it’s worth getting in early to book your treatments as I had to try a couple of times the week beforehand as you book centrally with Champneys and there was quite a wait on the phone. They did call me back to arrange it though, so worth emailing if you struggle. This really is a proper spa hotel. By that I mean it’s truly luxurious and you can’t beat the setting. I’m missing it already! If you love a period property, why not check out my own Victorian renovation before and after photos and video?